You’re a woman that really cares about fashion and style. You’re constantly on the go and you need a product that is reliable — one that will do the job effectively and precisely—years on end without running into problems. But you’re also on a budget and would prefer not to break it. Just to let you know, you’ve come to the right place! The content presented on this website will easily guide you through finding the best curling wand to satisfy your everyday styling needs. But first, let’s kill the awkward “curling wand vs. curling iron” dispute. The two are very similar, but produce different results. The styling of a curling wand is a lot more natural and smooth. Many people who choose the curling wand over the traditional curling iron seek newer, faster, more vibrant and less restrictive styling. Let’s start! Sometimes traditional tools can get of the way of fostering innovation. Many people are reluctant at the first sight of the clamp-less curling wand. But all of them are quick to realize their benefits. There are many different curling wands being sold on the Internet, some better than other. These all range in price, brand, type, colour, composition, weight, length, thickness, temperature, feel, mobility and more. Choosing may now seem a bit overwhelming, but I assure you, this will be an easy task. No matter how fickle and picky you are. First, let’s establish what you’ll require from your curling wand. 1. What is the Lenght of Your Hair? The first thing you want to take into consideration is the length of the curling wand. Assessing the length of your hair will give you an idea of the length as well as the thickness of the curling wand you’ll wish to be. It’s important that you do not skip this step since purchasing a curling wand that has wrong dimensions will reduce it’s usability. Women with long hair will want to get a curling wand that has a longer rod, which is the heated portion of the wand. Unsure if you fit in this category? The general rule of thumbs is that if your hair is longer than your shoulders length, then it is recommend that you get a longer rod. A longer rod will be of higher use because it’ll allow you to wrap longer strands of your hair in one set instead of two. Better for your style, your time and the health of your hair. A shorter rod with longer hair will have doing two sets instead of one. Since it’s practically impossible not to have both sets overlap, you’re hair will be prone to damage. You might want to foresee what kind of style you’ll want once you have your curling wand. If you’re decided on letting your hair grow longer, then getting a curling wand with a longer rod will work best for you in the future. Recommendation: If you have long hair, we recommend a wand that is greater than 6″ long. For more in-depth information about curling long hair with a curling wand, read our article. 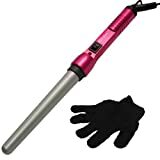 Women with shorter hair styles will want to get a curling wand that has a shorter rod. If you have short hair, it’s very important that you pick the appropriate wand. Since shorter hair requires a lot more finesse and precision in styling, you’ll need to find a curling wand that best honours those requirement. Fortunately, there is quite a multitude of wands that can do just what you’re looking for. As I mentioned early in the last paragraph, you might like forecasting what you’re hair will look in the future. If you intend on keeping them short, then it’s no problem: go for a shorter rod. For short hair, we recommend a wand that is shorter than 6″ long and less than 1″ in thickess. For more information on the topic of curling short hair with a wand, read this article. The conical shaped hair wand provides great versatility right in the palm of your hand. Since their rods have both a thick and small end, you can create curls in that range in size, without having to use another tool. You’ll notice that some wands have their cone-shaped barrel run at a steeper slope, which means you can get thicker curls as well as smaller curls. Try to imagine the range in size you’ll want to style your hair into. If you’re unsure, by choosing the one with the steeper shape, you’ll be opting for greater versatility. For those of you who are specifically looking versatility of use, you might be crossed between the interchangeable and conical shape types. But remember that the interchangeable barrels may only be best in a professional setting. For the women on the go, who needs no fussing around: the cone shaped rod is what she needs! There are many hair wands that give you the ability to change it’s barrel. This is very popular in professional settings like hair salons. But were seeing many brands like Cortex—who are now selling wands packaged with a sets of interchangeable barrels. Remarkably, they come at an affordable price for the hair amateur. Although you might have the pay a little extra—if it’s your budget—we recommend that definitely put in the extra bucks. What you’ll have is a tool that gives you the freedom to create any style you want. You probably know that the traditional curling iron comes in many different materials and so it’s very likely that you’re already be familiar with them. But for the sake of helping you choose the right curling wand for you, let’s have a recap of what each materials brings into the game. Ceramic and Tourmaline curling wands produce negative ions in your hair, which is GOOD. Studies on hair health show that damaged hair are made of more of a positive ions than negative ones. Research also shows that reverting hair back into its negative charge directly correlates with healthier hair and better styling results. What makes an ion negative or positive? Negative ions have more negative electrons than positive ones. Positive ions have more positive electrons than negative ones. Choose a ceramic or tourmaline curling wand for healthier and better looking hair. The ceramic curling wand is one of the healthiest of choices for your hair. Like all ceramic heated tools, they produce negative ions in your hair. Ionic atoms are ones that positively or negatively charged. Hair that has gone through damage are positively charged, which leaves the hair dry and brittled. By using ceramic, you’ll reverse the effects of damage and leave your hair smoother and shinier. The tourmaline curling wand creates an even greater amount of negative than its ceramic counterparts. Although not the difference is not outstandingly great, it is worth a mention. The two materials are very similar and so choosing between the two can sometimes be confusing. If crossed, allow yourself to disregard the material and focus on finding the other characteristics that makes one of the two, the better hair wand. The titanium curling wand works best for those of you with untameable, coarse hair. Titanium can withstand heat much longer periods of time than ceramic and tourmaline. It spreads heat evenly along it’s surface very effectively, which is important if you want consistency when styling your hair. Titanium is the smoothest of the three materials. This should appeal to those of you who have coarse hair—as it prevents the snagging of the hair. What is the Best Brand for Curling Wands? Now all brands on this website are the best of the best. Each brand seems to have their advantage or appeal. Cortex has a great line of interchangeable-barrel curling wands. They are known having a variety of product to choose from in this category. Bed Head has great quality product at an affordable price and that are accessible to every one. Remington is also one of the best for quality and low prices. They do not mess around with gimmicky—so, no fuss no frills—just and exactly what you need. Pro-Tools strives to bring professional quality product for the at home user. They are constantly look for ways to bring greater functionality in their product. What Should Be Included in The Curling Wand Package? Many find that having a heat protection glove helps them style their hair faster and more effectively. Take note that all the curling wands shown on this website come with the protective glove.Instructions and security recommendations will always be provided. You should definitely read them. This will prevent damage to your hair, to the product, and the environment in which you’ll be using it. So What About Special Features and Functionalities? If you’re one of those who love added functionalities because you simply do not like to do things simply. Make sure you’re satisfied with the length of the curling wand before your make a purchase. The length in which they are offered varies form 3 to 11 feet of cord. For some of you, this is too short or two long. So establish what’s best for you by imagining how you’ll be using. If you intend on using this in the bathroom, then 3-5 feet should be enough (given that there’s an available plug near). But if you’re one of those people that don’t stay still while doing their hair, then get longer. This is great for those of you who want greater ease of use. Basically, at the end of your wand, the electrical cord will swivel in the direction in which your face. This will make it easier for you to style your hair. Also, if you’re one of those people who move around a lot as you get prepared, then this is for you. Many curling wands come with the programmable shutoff feature. So can have your mind at ease instead of being afraid you forgot to shut it off before leaving. Some of the best curling wand will have an easy grip / no slip handle. This handy feature (pun intended) will prevent burns. It’s easy to drop a hair wand if you’re not careful. By having the easy grip (usually made of rubber), you’ll reduce your chances of dropping it and getting burned (or breaking the tool). Many brands come with a guarantee. Depending on the brand, type and price of the product, you’ll be offered a guarantee that can last up to 10 years. If you’re product goes defective, you’ll be eligible to receive a new one or get a refund. The leading brands in the industry have established a very high standard and typically, their products last. Cortex for example, takes pride in the fact that since their launch, most of their products were rarely called for defects.